Anyone interested in Unimogs, Pinzgauers, Haflingers, Galändawagens (not the $100k+ ones), VW Syncros, Volvo 303s, and other unusual European off road vehicles may want to check out the Southwest Mogfest this weekend (Oct 13, 14, 15) at the Calico KOA in Yermo, CA. 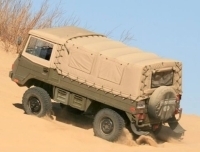 There will certainly be a number of different model Unimogs and Pinzgauers in attendance. If you want to see these vehicles in action off road please come and participate in the runs.